To misquote my sister’s favorite TV chef Ina Garten, how pretty is that? Red bell peppers are one of my top three favorite vegetables. They’re sweet without being sugary, delicious raw and cooked into oblivion, or anywhere in between, and they’re so darned gorgeous. Chicken thighs are flavorful, inexpensive, and really shine when they’ve had a long, slow braise. I used skinless, boneless thighs, but you can leave the skin and/or bones on for depth of flavor. In that case, you may want to defat the sauce. Scoop out the chicken and veg with a slotted spoon and set them aside in a covered bowl to keep warm. Pour the sauce into a small bowl (preferably metal; it’ll conduct the heat away faster) and set that in a sink or large bowl of ice water, making sure that the water doesn’t spill into the sauce. Leave it alone for 30 minutes or so. The fat will rise to the top, and you can skim it off. If you want to go the extra fat-free step (healthier, but not necessary), you can put the cooled sauce in the freezer for 20 minutes, which should solidify the fat and make it easier to remove. I puréed some of the peppers and onions into the sauce, but you can strain them out and serve them on the side if you prefer. If you’re in a time crunch, a fat separator is your friend. This clever gadget looks like a measuring cup (usually 16-32 oz.) with the spout originating at the base of the cup, rather than the top. Pour your hot sauce in the cup and let it sit for about 15 minutes. The fat will rise to the top. When you pour (slowly and carefully) the sauce back into your pan, the defatted liquid on the bottom comes out first. Just stop pouring when you reach the fatty layer. I like to de-fat the liquid, then purée the onions, garlic and a few of the peppers into the sauce. This accomplishes several goals at once: It thickens the sauce without extra fat, it adds layers of flavor and rich color, and it adds nutrition to the sauce, so that certain family members (you know who you are!) end up eating more veg than they might choose to on their own. I’m only thinking of their health. I served these with quartered new potatoes boiled in salty water with a smashed clove of garlic, then tossed with chives and a small dab of butter. The dish is equally suited to these taters, egg noodles, brown rice (or grain of your choice), or just a hunk of good bread to mop up the sauce. Warm 1 tbs. oil over medium-high heat in a large skillet (preferably cast iron) with a lid. Sprinkle the chicken liberally with salt and pepper. Add skin-side down to the hot pan; cook without moving for about 5 minutes. When the chicken’s well browned it will release easily from the pan. If it’s sticking, leave it for another minute or two. Flip thighs and brown on the second side for another 3 to 5 minutes. Remove to a bowl. Add the second tbs. oil to the pan and toss in the onion, peppers, and garlic clove. If you’re using dried thyme, add it now. Cook, stirring often, for about 5 minutes until the veg begin to soften and the lovely browned bits from the chicken are released. Add the wine and cook for 1 minute; add the stock and stir. Nestle the thighs among the veggies, cover pan, and reduce the heat to low. Simmer, covered, for at least an hour (and up to 90 minutes), until the onions and peppers are meltingly tender and the chicken’s falling apart. Remove the chicken and peppers to a serving platter. Peel the garlic clove, if necessary, and mash into the sauce. Raise heat to high and boil fiercely for a minute or two to concentrate the sauce. If you want a thicker sauce, don’t boil it just yet. Mash the butter and flour together in a small bowl (this is a beurre manié). Whisk the beurre manié into the sauce, raise the heat to medium-high, and cook, stirring, until the sauce has thickened. If it’s too thick, add a little more stock. If you want a smooth sauce, purée it with a stick blender, but it’s not necessary. Pour the sauce over the chicken (or serve it on the side). 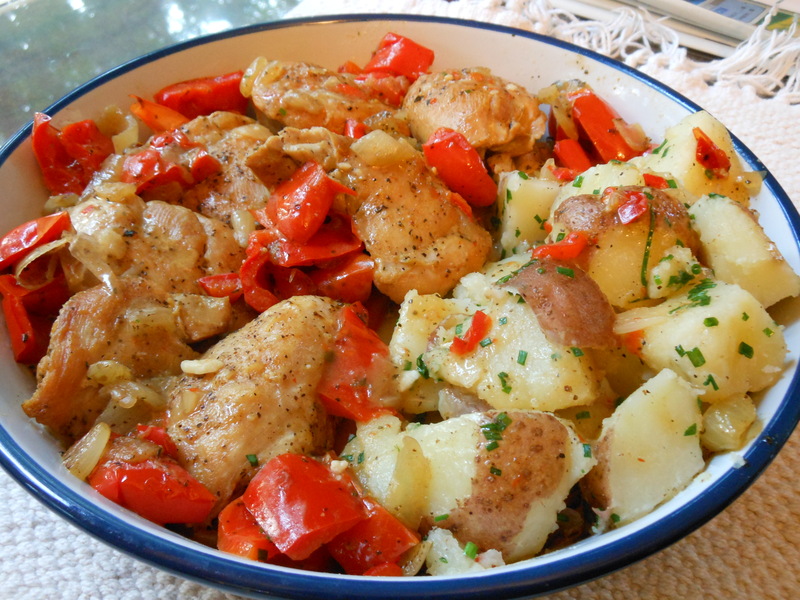 This entry was posted in main courses, meat, poultry,and fish and tagged bell peppers, casserole, chicken, chicken thighs, healthy, one-pot dinner, peppers. Bookmark the permalink.